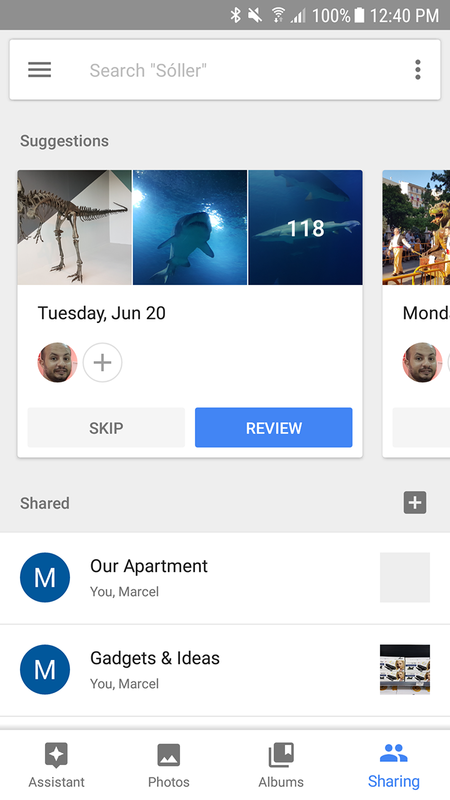 Google announced yesterday that the promised Shared Library and Suggested Sharing features that were demoed last month at I/O are going live in Google Photos. When we covered the news, some of these were starting to show up on the web version of Photos then seeding began for a major update to version 3.0 of the Android app. Still, installing the new version didn't seem to enable any of the new features as they must have required a server-side switch as well. 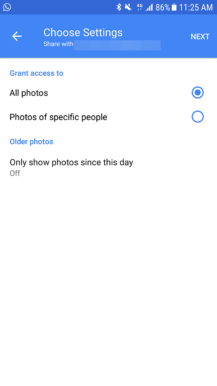 I was on Google Photos 2.17 this morning and grabbed the 3.0 APK from APK Mirror since the Play Store hadn't made the update available for me yet. Upon opening the app, I instantly got the two new features, so it looks like the server-side switch has been flipped. It may not be on for everyone just yet, or it may need an app restart or cache clearing (on Photos? Ouch! ), so your best bet is getting the required 3.0 on your device and checking to see if you have the options there, then being patient if it isn't. Update: Google Photos 3.0 may not be required to get Shared Libraries as some users are seeing the option on 2.17 as well. Google works in mysterious ways, my friends. 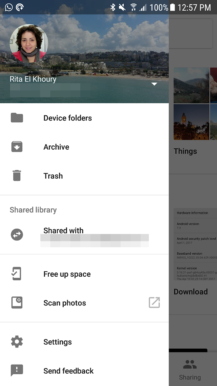 The first two things you will notice with Google Photos 3.0 are a 4th new tab at the bottom called Sharing and a new item in the left side menu called Shared library. Let's go through them. Once you tap on Shared library, you will be shown the splash screen image that I used at the top of this post. Tap on Get started and you'll be asked to select your partner. That is only one partner. You can't share parts of your library with someone and other parts with someone else, that's just not possible now. I hope the option gets added in the future because I'd also like to automatically share parts of my library with my parents and friends. I selected my husband, since he's the only person I often find myself having to make albums and manually share them with. You'll have to choose between sharing all your photos or only photos of specific people. 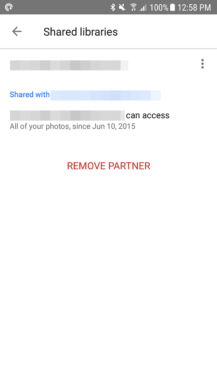 In the second case, you can select multiple people, which is nice because you likely want to share with your partner photos of yourself, them, and maybe other members of your family/friends. 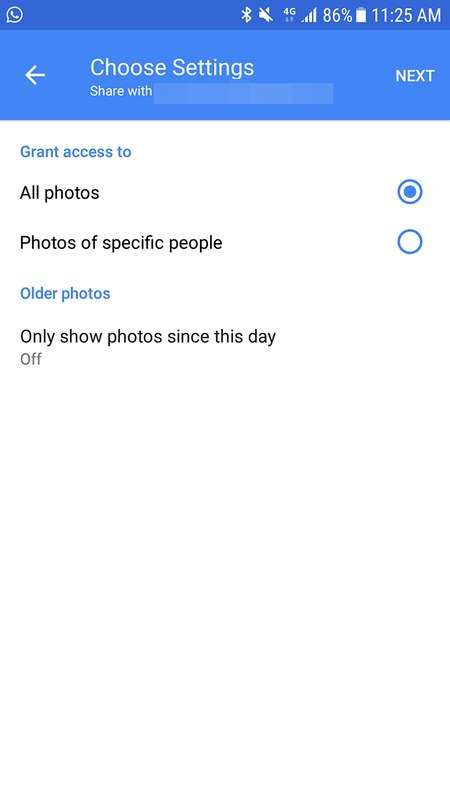 However, that doesn't include any photos of landscapes, things, places, or other miscellaneous shots you take, so keep in mind that this second option only shares photos with those people in them. The other choice you have is time-based. 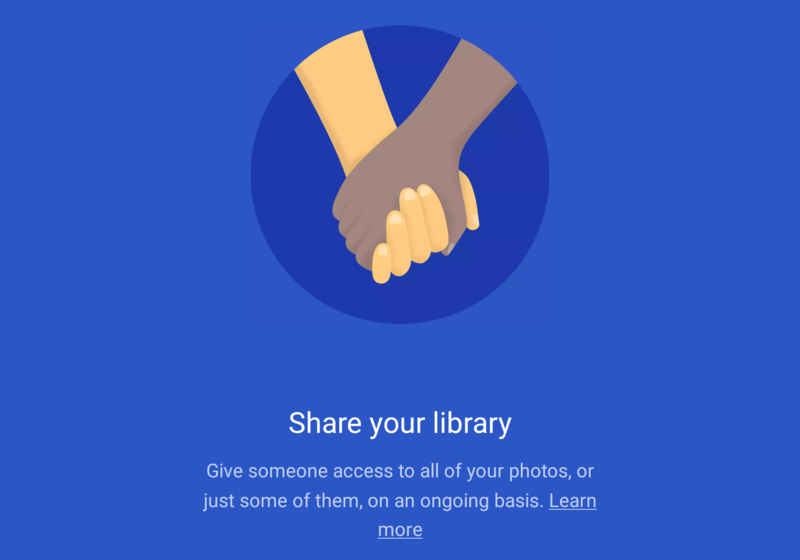 You can elect to share all your library regardless of when a photo was taken or only photos taken after a certain date. That's cool if you're not sure what is in your Photos backlog and you'd rather only show recent photos. But also keep in mind that scanned photos or edited photos might have different dates than the day they were taken on. Once that's done, an invitation is sent to your partner and when they accept, the side menu on your device will display Shared with *email address*. 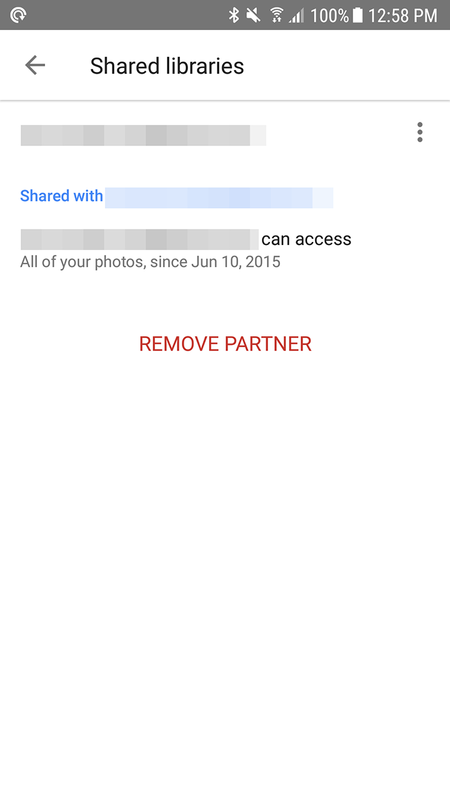 Tapping on that reveals all the photos that your partner can see and the overflow menu takes you to the settings page where you can stop sharing altogether, remove that partner (which will also stop them from sharing their library with you), or change the parameters you chose in case you changed your mind. On the recipient's end, they can choose to automatically save all shared photos to their library or only photos of select people. All these will be searchable and categorized in their Photos library, just like their own photos. 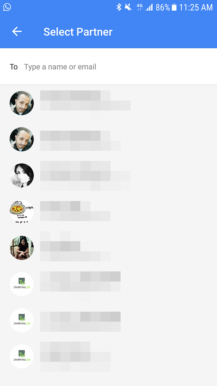 The new Sharing tab replaces the old Shared group that used to show up in the Albums tab. This is where you will see all your shared albums and photos (from you with others and from others with you) as well as the new Suggestions on top. These are cards of groups of photos and suggested albums that Photos considers to be related and where at least one or many people feature repeatedly. 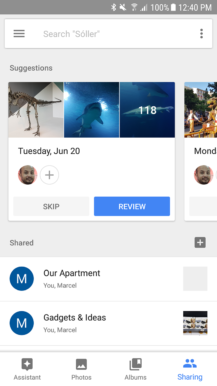 You can also see the date, total number of photos, and options to Skip or Review the suggestion. 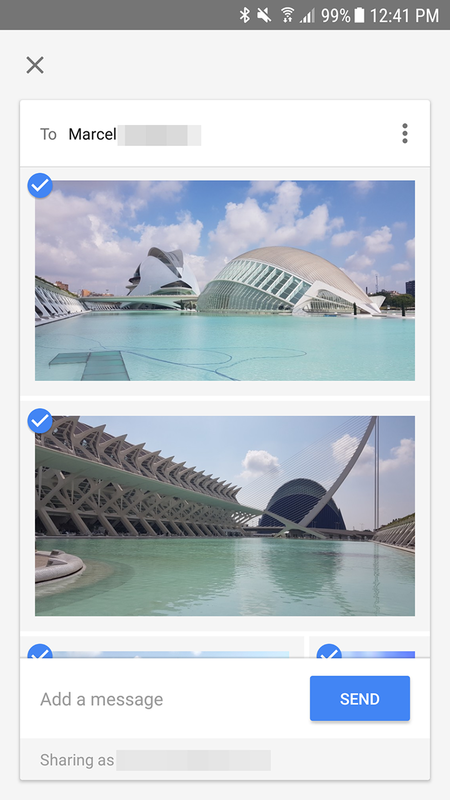 If you don't want to share a certain group of photos, you can skip it and it won't show up in suggestions anymore. But if you like one of the suggestions, you have to review it before sharing. That lets you specify people to share it with (with the easy option of tapping on the suggested contact), choose an album title, remove or add photos, and write your own message, then send. 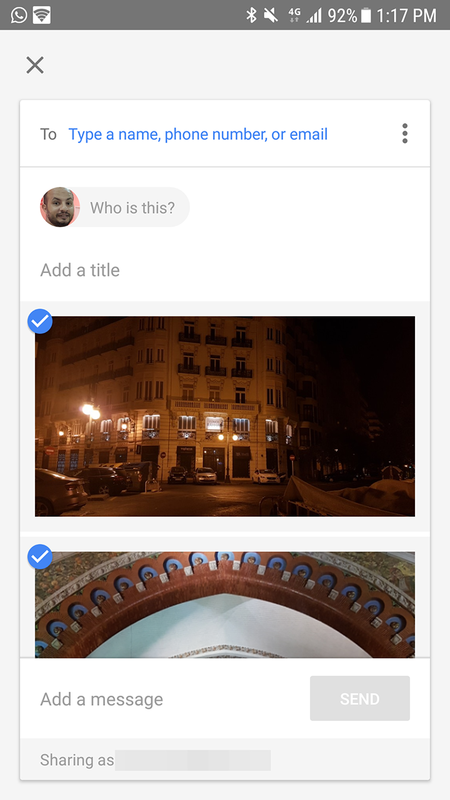 Technically, if the person that's recognized in the suggestion uses Google Photos and has turned on the option to allow others to recognize their face (under Settings > Group similar faces > Allow contacts to recognize your face), you shouldn't see a "Who is this?" next to their face, but their name instead. That didn't show up for me because it looks like all my contacts still haven't turned on the option. 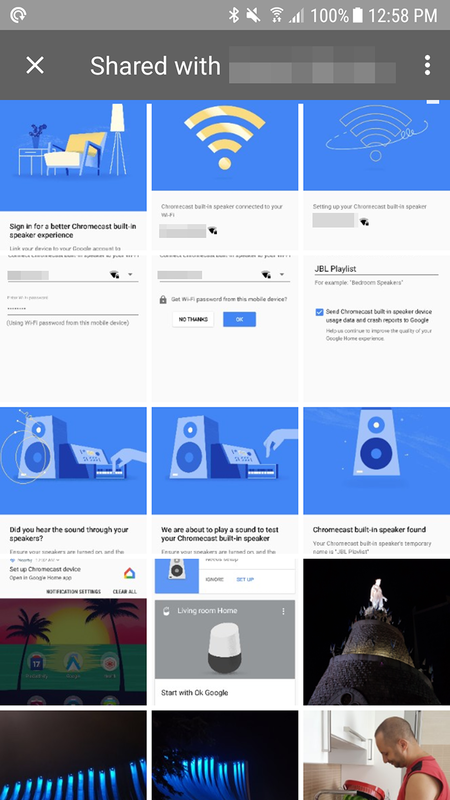 If you need to know more about how these features work on the web, Android, and iOS, you can check these three Google support pages for labeling your face, suggested sharing, and library sharing. 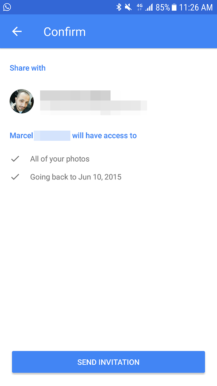 As I said at the start, it appears that Google Photos 3.0 is required for both of these features to show up. You can grab it from APK Mirror if it isn't yet available for you on the Play Store. But that doesn't guarantee that the options will be live. There might be a server-side switch or you may need to restart the app or clear some data/cache to get them to show up. Good luck!